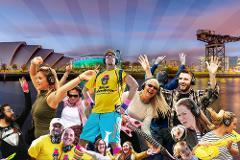 It's a Flash Mob, it's a Silent Disco, It’s a roaming, rhythmic riot through Glasgow! It's time. To face. The music! Join the original, award-winning Silent Adventure Disco tour through the streets of Glasgow in a musical mash-up of madness! Sing your hearts out, dance like no-one is watching, and have a right good laugh with our team of groovy guides, and hysterical host! Super hi-tech headphones will transport you through the decades, with hit songs from way back when, to chart-topping singles of today! Make the city of Glasgow your own personal dancefloor, and party like you've never partied before! You'll start your Silent Disco tour with a wicked warm up from your host with the most, and then set off on your Silent Adventure surrounded by the very best Glasgow has to offer. You'll wonder why you've never boogied past Buchanan Galleries, or pranced by Princes Square before! A fabulous flash mob that you didnt even know you were a part of - the world is your stage now! Please wear dancing shoes, and bring water, an open mind and leave your inhibitions at home. Over 5's only and no buggies please - you'll need both hands for dancing! (Babes in arms welcome). Please make sure you arrive outside Absurd Bird Glasgow at least 15 minutes ahead of the tour leaving plenty of time to get checked in, recieve your headphones, check hair and makeup and gather your nerves. Keep a hold of your ticket, as you might even grab a discount at Absurd Bird too! Every Silent Adventure lasts around an hour, and waits for no man, so please make sure you get there early - this is one party bus you don't want to miss! Check out our terms and conditions for any further information. Guests waive all liability for damage, injury or loss on tours. Our tour finish locations can vary, but all will be a stones throw away from the starting venue, no more than 10 minutes dance away! The party is just getting started, and you are the guest of honour - now dance, baby, dance!